Tsubokawa is the manufacturer in Kawajiri near Hiroshima that owns and produces Koyomo brushes. Kawajiri is part of Kure City, one of Japans most famous areas for “Fude” production, the so-called “Kawajiri-Fude”. The President, Hiromi Tsubokawa is running the family owned business in second generation. This Japanese Brush Company still mainly focuses on the production of calligraphy brushes. Hence, the assortment of makeup brushes is limited and geared towards customers that appreciate the special traditional craftsmanship that goes into each and every individual Koyomo brush. The name KOYOMO represents what these brushes are made of. The meaning of KO is old/ancient and YOMO is goat. A Koyomo brush is “literally” from top to bottom made to have a very long lifespan. The hair used in a Koyomo brush is “ancient” goat hair harvested in the 70’s. The hair texture is essential for a high quality makeup brush. In comparison, the goat hair currently available and used in makeup brushes is thin with hollow spaces in the middle. It can break easier and is not as durable. Whereas with “old wool”, the inside consists of a compact structure and the surface is a lot thicker and therefore more resilient. The “old wool” is undoubtedly better in quality and durability. Specialists like professional calligraphers and brush manufacturers recognise and appreciate the superiority of the mature goat hair. It is tremendously desirable, very rare and high in value. Koyomo is proud to own the largest stock worldwide. Additionally, Koyomo’s President has confirmed that sufficient hair is available to ensure brush manufacturing for another generation. However, the natural material used in Koyomo brushes is limited and that’s a fact!!! Koyomo’s goal when designing their makeup brushes was to make sure that the user is going to instantly feel the high quality. The brushes are weighted to create a balance for optimal use and comfortable grip. The handles are manufactured in Kawajiri and made out of cherry wood. To paint the handles in their special design they are forwarded to Shinichi Sumikawa, a highly regarded product designer and an honorary professor at Osaka University of arts. The Hana Brush Series are finished with a simpler method of brush handle lacquering. However, Tsuki, Hananuri and Yuki Series are made with Aizu Urushi coating. Aizu Urushi is a form of Japanese art that is very challenging and takes a lot of skill to execute. It starts with a first coat of lacquer, then the entire surface is speckled with silver and then another coat of lacquer is applied. This process will be repeated several times, which makes the coating iridescent and unique on each handle. Using this extravagant procedure of lacquering will ensure a long lifespan of the handle. The other striking effect this method of painting has is that the longer you use the brush the more vivid red the handle will become. Each one of the Koyomo brushes is undoubtedly a unique piece of art!!! To order please download and complete the Fude Japan (Order Form) and send it to fudejapan@hotmail.com. Thanks!!! 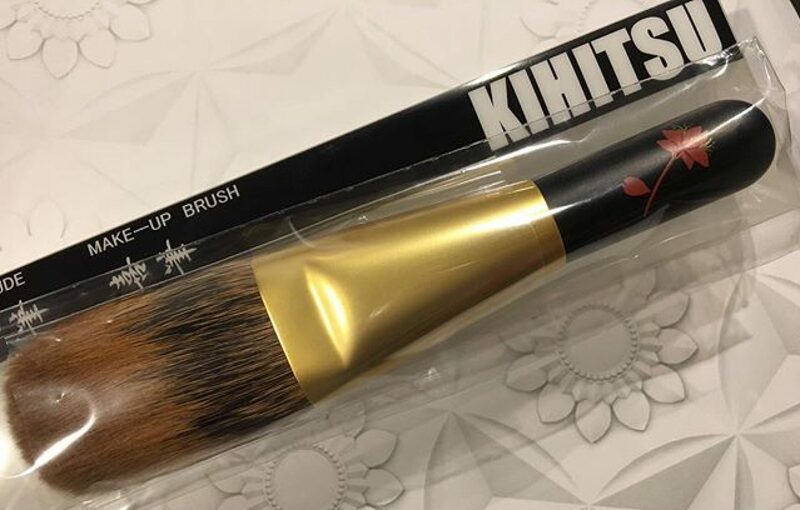 I like to know if you have the Koyomo Hana (red) Sokoho	Cheek brush available to order?